Here we’ve assembled a list of some of the most popular holiday shopping destinations in New York City. Whether you’re looking for the hottest new toys for your kids, a special watch or piece of jewelry for your significant other, or perhaps a new holiday outfit for yourself, shopping in New York is a great way to get in the holiday spirit! The Radio City Christmas Spectacular® is a one-of-a-kind celebration for family, friends, and loved ones. 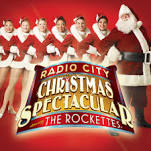 Share in the joy with the Rockettes®, Santa, the Nutcracker, and the unforgettable Living Nativity. No one does it better than the Radio City Christmas Spectacular! Find tickets now! ABC Carpet & Home is a ten-floor facility offering an inspired collection of rugs, furniture, antiques, home textiles, accessories and sustainable furnishings. They also have an outlet store in the Bronx. This Manhattan institution has been a high-end shopping destination in the city since 1923, offering designer fashions, accessories, cosmetics and home goods. Special features include concierge services for restaurant reservations, theater, concerts, sporting events, car services, charging of cell phone, Ipads, etc., personal shopping and the Chantecaille Energy Spa. On site you can dine at Fred's, a restaurant serving lunch, dinner, high tea on weekdays and brunch on weekends. Bergdorf Goodman is known throughout the world for elegance, luxury, and superior service. Products include designer fashions, cosmetics, jewelry and accessories. Special services include personal shopping, fur storage, a bridal salon and the John Barrett Salon. There are four spots for dining; the BG Restaurant is on the 7th floor overlooking Central Park. Dating back to the late 1800's, Bloomingdale's is part of New York's history. This mid- to high-end department store features men's, women's and children's fashions, jewelry and accessories, cosmetics and home furnishings. They are also known for their shopping bags. Special services include personal shopping, interior designers, wedding registry and five restaurants. Bloomingdale's SoHo location opened in 2004, offering fashions, accessories and home furnishings in a smaller setting. Forty Carrots Restaurant is on the second floor. This high-end specialty store offers jewelry, watches, handbags and notions for the most discriminating buyers. This is the place for fine jewelry, timepieces and, of course, diamonds. Harry Winston founded his company in 1932 and is known for the Hope Diamond (which he purchased in 1949), red carpet jewels and the finest of vintage pieces. This is Henri Bendel's flagship store, which is a four-story boutique which was converted from three townhouses on Fifth Avenue and now holds official landmark status. High-end, yet trendy, they carry jewelry, cosmetics, handbags, lingerie and more. Lord & Taylor dates back to 1826 and has always offered moderate to upscale classic styles in clothing, as well as jewelry, accessories, cosmetics and gift items. Of special note L&T were the first to offer personal shopping. Macy's first opened in 1858 as a "fancy dry goods" store. In the 1860's, Macy's introduced the very first in-store Santa Claus and the first holiday window displays. Today, Macy's is known for moderate to upscale clothing, home goods, jewelry, accessories and cosmetics, and also for the movie "Miracle on 34th Street". This Herald Square location is considered the world's largest store and features several restaurants and snack shops, personal shopping, gift registry and a souvenir shop. The Saks Fifth Avenue flagship store opened in 1924 by Horace Saks and Bernard Gimbel. Today, this 10-floor department store features upscale clothing, jewelry and accessories, cosmetics, home goods and gifts, plus a beauty spa, bridal suite, fur salon, restaurant and personal shopping. Since 1837, Tiffany & Co. has been the world's premier jeweler and America's house of design, known for its rare and magnificent diamonds. Tiffany represents the finest of jewelry, watches, accessories, tableware and gifts. The famous Tiffany Blue Box, adorned with white ribbon, is an international symbol of style and sophistication. H&M was established in Sweden in 1947, offering clothing for men, women and children, as well as cosmetics, shoes and accessories. Their budget-friendly concept is to provide quality goods at the best price. They entered the U.S. market in the late 1990's and operate multiple stores in New York City. To submit a shopping listing to this page, please use our Submit Your Listing page.